Kisses From Heaven flies in her whiteness through the wind enjoying the snow kisses. 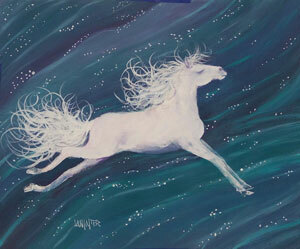 This adorably sweet spirit horse is white against a purple, teal and turquoise sky. Kisses From Heaven is an 11”x 14” print. It is sure to add a touch of joy to any room.